Twitter (TWTR) is set to report Q2 earnings tonight after the close with a conference call to follow at 5pm ET. Current Capital IQ consensus stands at EPS of $0.09 on Revenues of $607.4 mln. Jack Dorsey marked one year at the helm this month but he hasn't been able to gain any traction with his initiatives. I guess being a part time CEO in two companies means you're not a CEO of two companies. Part time CEO = Part time performance. Last Quarter Q1- Stock was sitting on its 50-sma (17.28) at the time of the report but a top line miss and weaker Q2 guidance led to further selling pressure. The stock fell apart to $14.81 and eventually found support at the $14 area. 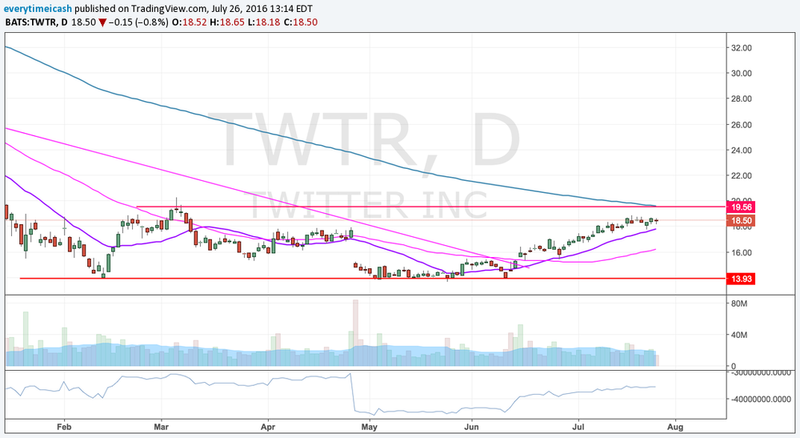 TWTR reported Q1 (Mar) earnings of $0.15 per share, $0.05 better than the Capital IQ Consensus of $0.10. Revenues rose 36.5% year/year to $595 mln vs the $607.55 mln Capital IQ Consensus.